MLK50 founder Wendi Thomas makes a confession: "Yeah, I like to play Spades," she says. "But I grew up in a super Jesus-y house where we weren't allowed to play cards. I learned how to play Spades and dominoes and all that stuff when I went away to college. And I remember coming home and getting money out of my daddy's penny jar — you know that change jar every daddy has — and teaching my younger siblings to play cards. Man, my mama was hot." Thomas doesn't hide her affinity for a good card game anymore. 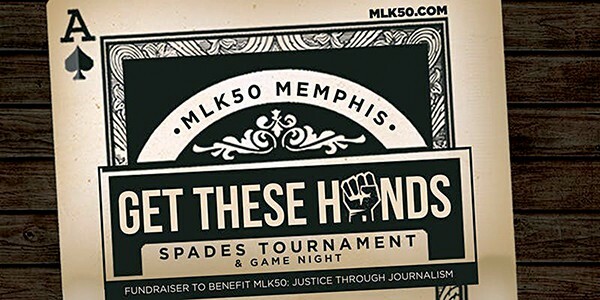 Past Tweets promoting Get These Hands — a card party and fund-raiser for MLK50 — have been loaded with smack talk and swagger. But that's all just part of the game. "I know I come off as very serious," Thomas says, having some fun with her own firebrand reputation. "But who doesn't like to get together and play cards and dominoes and just have a good time and be silly? You need that kind of recharging so you can go back and do the work. "The party is an opportunity to come out of that super-serious, depressing-but-important space and recognize that we all need self care," Thomas says. Now in its second year, Thomas' MLK50 project was recently invited into ProPublica's Local Reporting Network and continues to do work at the crossroads of poverty, power, and public policy. "It's distressing to see how many businesses, government agencies, and nonprofits are propped up by poverty," says Thomas, who recently filed a lawsuit against the Memphis and Shelby County Crime Commission to make their records public. Spades won't be the only game. There will be tables for dominos and Taboo as well as Uno, whist, and other card games. Card party-inspired snacks will be available.